The fields are at the corner of Blair Mill and County Line Rds. at the cross section where Hatboro, Horsham and Warminster meet. For directions, please go to Mapquest or Google. See below the picture for a description of the fields. The Snack Stand is located next to Right Field of Frattone, behind Home Plate of Albright. 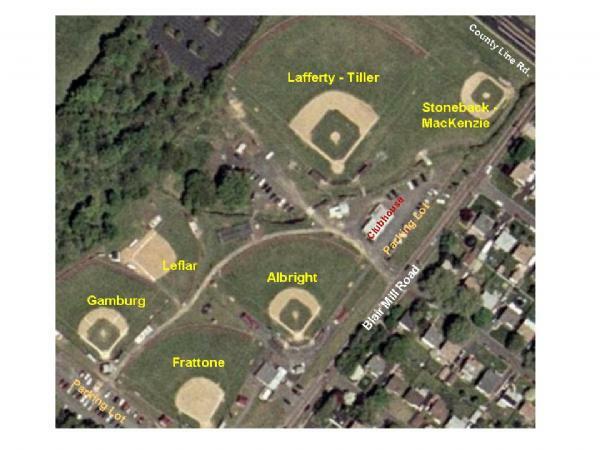 Two parking lots are located between Albright and Lafferty-Tiller; and on the Left Field Sides of Frattone and Gamburg.